B.A. Ramirez & Sons Ornamental Iron Works, Inc. is committed to providing Carlsbad with exceptional ironwork services at very competitive prices. Established in 1980, we have served thousands of satisfied clients throughout San Diego County, including Carlsbad business owners, homeowners, property managers, contractors, and more. 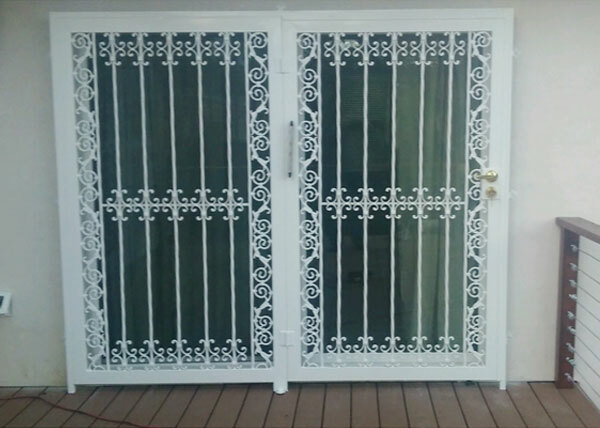 Our highly experienced company specializes in fabricating iron fencing, gates, doors, railings, and more. 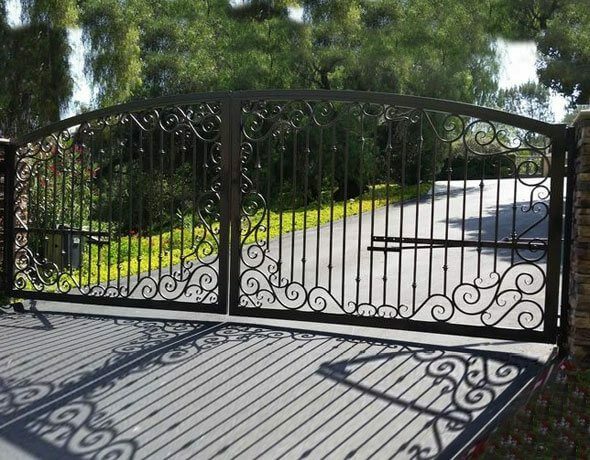 By offering our quality workmanship alongside fair business practices, timely service, and superior customer care, we have earned an outstanding reputation for our ironwork services in Carlsbad and beyond. B.A. Ramirez & Sons Ornamental Iron Works, Inc. performs all iron work to the highest of professional standards. Our iron work integrates Old World craftsmanship and always complies with applicable municipal building codes, ADA standards, and homeowners association CC&Rs. Further, we make every effort to leave your building, property, or landscape as clean as we first found it. That way, when we are done, the only difference you'll see is your new, beautifully crafted decorative or wrought iron fence, entry gate, driveway gate, enclosure, door, staircase railing, handrail, guardrail, or window guard. Call us today for all of your residential or commercial ironwork needs in Carlsbad. With a fence, gate, railing, door, or other custom ironwork piece from B.A. Ramirez & Sons, you'll be sure to add beauty, functionality, and value to your home or business. We are available Monday through Friday and are happy to schedule an estimate at your home or business. For those that wish to repair their existing iron fences, we also offer comprehensive iron fence repair and replacement services in Carlsbad. Trust B.A. Ramirez & Sons Ornamental Iron Works, Inc. for all of your commercial iron work needs in Carlsbad. Our experienced professionals will work closely with you to design the perfect iron product, customized for your specific property, needs, and budget. 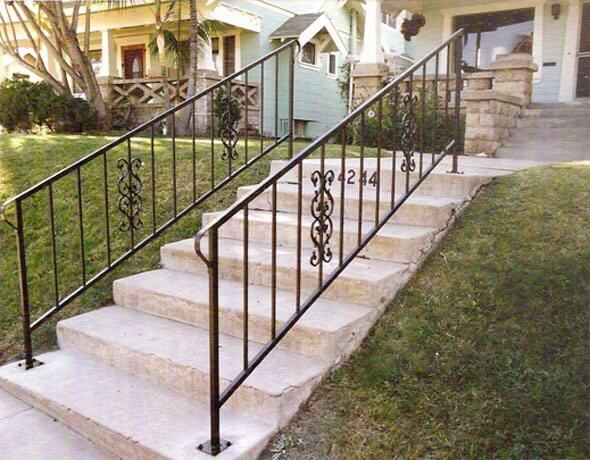 For some clients, this will involve designing, building, and installing ADA-compliant iron handrails. For others, this will include adding iron security or burglar bars on all accessible windows. Whatever your commercial iron fence, gate, door, railing, or window guard needs in Carlsbad, you can count on us to provide the perfect solution at a cost-effective price. Call us today to get started. B.A. 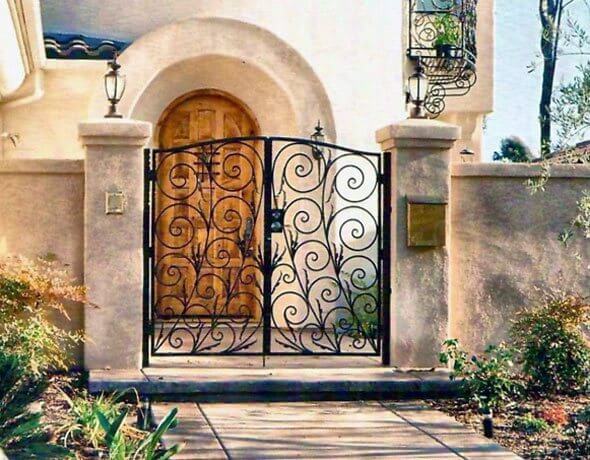 Ramirez & Sons Ornamental Iron Works, Inc. provides homeowners in Carlsbad with beautiful iron fences, gates, doors, railings, and window guards. Available at a great value, our residential iron work is custom designed to add simple, elegant style to your Carlsbad home while also meeting your desired functional goals. Carlsbad clients love our iron perimeter fences (which add security while clearly defining and enclosing property perimeters) as well as our wrought iron gates (ideal for driveways, main entrances, and side yard/garden entryways). Our residential ironwork services ranges from the basic and highly functional to the highly ornate. In all cases, we comply with current ADA standards, building codes, and fire safety requirements, and aim to give you the best results for your budget. Call today and schedule your free online estimate. Our custom iron gates are available to Carlsbad customers at a great value. They are fully customizable, durably built, carefully installed, and reasonably priced. 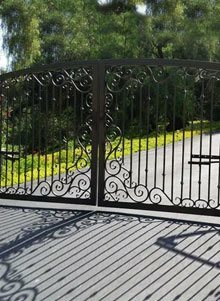 With decades of experience, we can create almost any type of iron gate you desire for your Carlsbad home or commercial property. 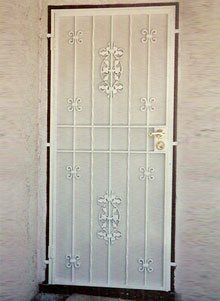 Our iron entry, security, and access gates are available in an endless combination of sizes, shapes, ornate designs, and finishes. They can also be fitted with card readers, latches, levers, handles, locks, intercoms, fobs, and other hardware and automated access control systems. Obtained from the industry's leading brands, such as LiftMaster, Ram Set, and DoorKing, our gate controllers and hardware feature high quality components and come with excellent manufacturer warranties (as well as our own one-year service warranty). 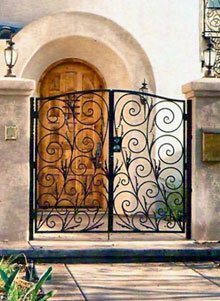 Call us today and learn more about our ornamental and wrought iron gates for Carlsbad customers. When it comes to installing automatic gates, that's where B.A. Ramirez & Sons truly excels. Our motorized entryway and driveway gates are made to not only look beautiful, but also function perfectly. 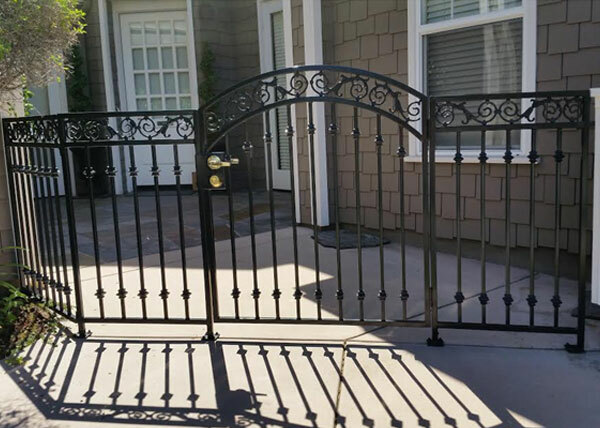 Every Carlsbad gate is custom made out of ornamental or wrought iron and then precision installed for a perfect fit. 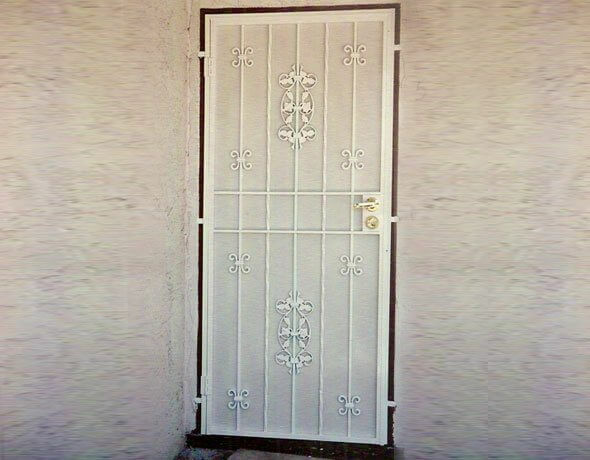 Once each gate is fully constructed, we add on your choice of hardware. Most of our clients in Carlsbad prefer DoorKing, Elite, LiftMaster, Linear, or RamSet, but we have the expertise to install any automatic gate opener system you choose. As part of our comprehensive service, we'll test out your automated gate system and ensure that it is working exactly as the manufacturer intended. All of our ironwork is backed by a one year labor and materials warranty, and all of our brand name automated gate systems are backed by an extensive manufacturer warranty. To learn more, call today. B.A. Ramirez & Sons Ornamental Iron Works, Inc. has been designing, building, and installing attractive, affordable iron fences in Carlsbad since 1980. We are able to custom make iron pool fences, privacy fences, perimeter fences, and more, all of which can range from the highly ornate to the strictly functional. We are skilled at working with tubular and solid iron, and offer Carlsbad customers options for hand-forged scrolls, decorative castings, vibrant finishes, and more. We also offer hot-dipped galvanization, metallization, and powder coat finishes for rust resistance. In addition to new iron fence installations in Carlsbad, we provide iron fence repair and replacement services. Whether your fence has been damaged by an accident or the elements, our experienced iron workers are available to perform full-service iron fence repairs and replacements in Carlsbad. Call us today for a free consultation--you are certain to be delighted by our affordable craftsmanship, superior customer service, and quality iron fencing services. 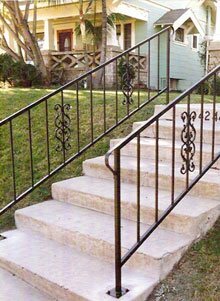 If you are looking to install a decorative or functional iron railing at your Carlsbad home or business, then trust B.A. 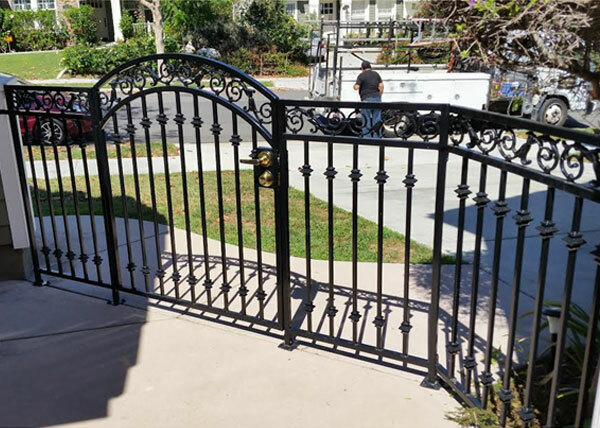 Ramirez & Sons Ornamental Iron Works, Inc.. We have the expertise to custom-design and install the perfect iron railing at your Carlsbad property, whether for balconies or staircases (including circular, rounded, spiral, and wrap-around staircases). 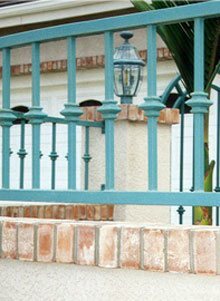 Our decorative iron railings in Carlsbad are available in a wide range of customizations, including powdercoat finishes (which are available in hundreds of colors), crown caps, wooden top rails, and decorative picket-type balusters (with knuckles, knobs, and baskets) or flowing hand-forged scrolls. 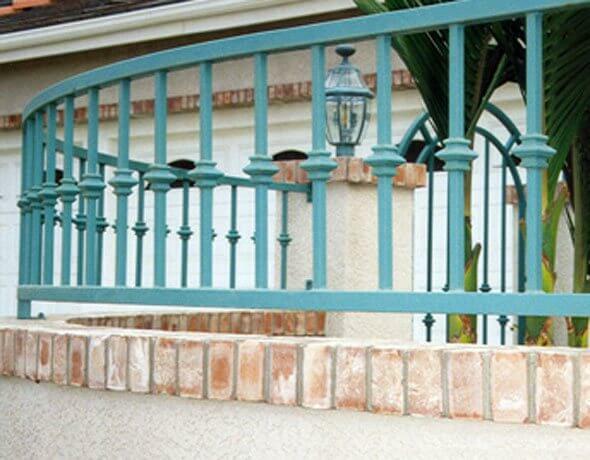 With so many options, our knowledgeable employees are readily available to help you with every stage of your custom iron railing project in Carlsbad. Call today to get started. Call us today to have us install a custom iron window guard or door at your Carlsbad property. We specialize in creating attractive, long-lasting iron window security bars and doors that are tailored to our customers' unique tastes, functional needs, and climate. For example, we can build iron security window guards to perfectly fit windows of any size or shape. They'll feature smooth or hammered iron, decorative iron castings, and durable hardware, and automatically include a quick-release mechanism for fire safety. Our iron doors offer even more opportunities for customization, as they can be installed within your door frame as a metal screen door or installed away a few feet away from your front door to create a secure yet decorative enclosure. Decorative enclosures work well with telephone entry systems and keypads. Call us today and learn how our experienced ironwork professionals can provide your Carlsbad home or business with a top quality, custom iron fence, gate, door, railing, or window guard at a great price. We are licensed, bonded, and insured, and comply with all relevant city, state, and county building codes. D43 This decorative patio door was installed for a home in Carlsbad, CA. It is built using a sturdy 1" x 3" steel tube frame and ½" steel tube pickets. The door features decorative "bird of paradise" castings throughout with cast scrolls in the center of the gate. A deadbolt and passage handle are built into this patio door. The door is finished with zinc primer and a gloss white finish coat. G20 This European style gate was made for a client in Carlsbad, CA. The steel gate features a combination of cast knuckle designs on each picket and decorative castings along the frame. G21 BA Ramirez installed this European style gate in Carlsbad, CA. The steel gate is coated with a black semi gloss powder coat paint finish.